On the 24th January, the Barbican Centre in London was the venue for the glamorous Dental Hygiene and Therapy Awards. These national awards celebrate dental hygienists and therapists who strive for excellence. The awards are judges by a group of dental hygienists, dental therapists and dentists who are at the top of their game. 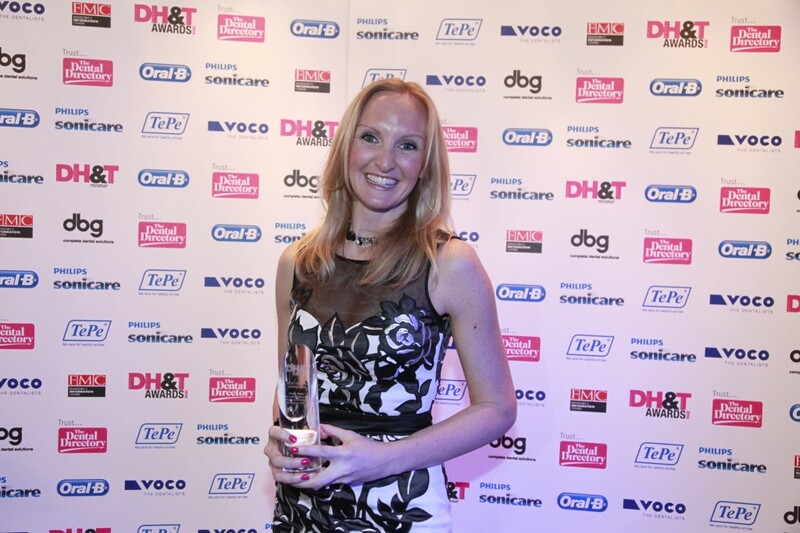 Nicola, our hygienist was short-listed for two awards; Hygienist Of The Year and Best Dental Innovation. To be short-listed alone was a tremendous achievement, however Nicola won the award for Best Dental Innovation! To win this award, Nicola undertook an oral health project in her local community. The idea for her project was initially formed, when her 5 year old daughter started school. Nicola noticed that there did not seem to be a good understanding of the oral and general health risks of children consuming high quantities of sweets, cakes and sugary drinks. With Nicola’s knowledge of oral hygiene and a passion for helping others, she was inspired to do something about it! Nicola decided to run oral health workshops at schools for Year One children (aged 5-6). In her workshops Nicola uses animal references to inspire the children, comparing their own teeth to those of their favourite furry friends. Games and play also create an interactive environment for them to learn about good oral health, hygiene and healthy eating. Getting the message across to the children was the first step. Nicola was determined to include the parents and get them thinking about a healthy diet for their families. To compliment these workshops, Nicola developed a series of sugar free baking recipes. Nicola produced a series of recipe cards for the sugar free recipes and also a sugar free recipe calendar. Nicola was thrilled at the DH+T Awards judging panel recognising all her hard work and effort. Nicola’s recipe cards and calendars are available at the clinic.